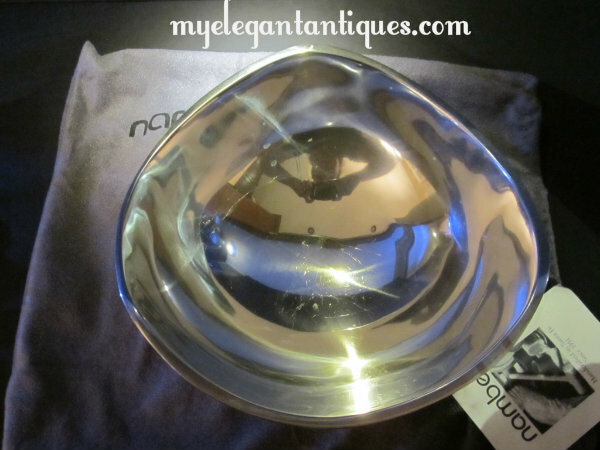 The Antiquarians are offering this beautiful, pre-owned Nambé bowl No. 527. Nambé describes this bowl as "uplifting and sensuous . . . is irresistible to hold". With a capacity of 1.5 quarts, this iconic bowl curves upward, rising into three gentle rim points. It stands 4-1/2" in height, and has a maximum diameter of 9-1/4". 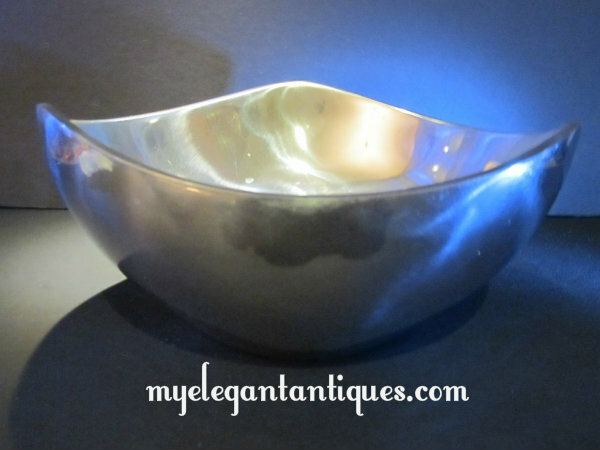 The original mold for this bowl was designed in 1967 by sculptor Richard K.Thomas. 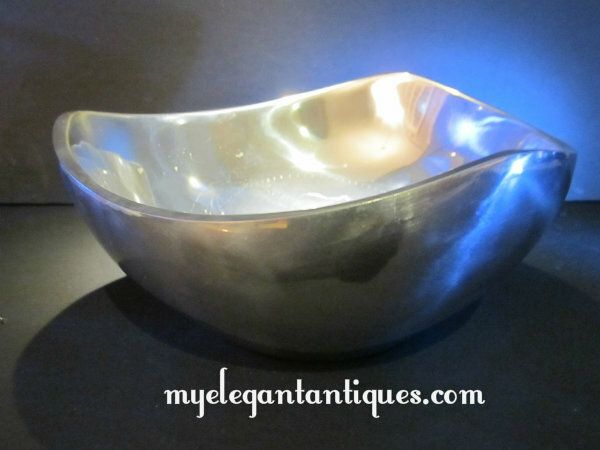 Fitting snugly into your hands, this bowl is truly a pleasure to hold! Even better, it pleases the eye, both as a work of art and a fine serving piece. Oven, broiler, stovetop and freezer safe, the gleaming metal of this bowl won't tarnish even when placed in an oven or freezer, after which it retains its temperature for long periods of time to keep pasta hot or fruit salad chilled. This bowl is in very good condition. It retains the original factory tag, as well as the retailers tag on its base, and it has its own protective flannel pouch to ensure its continued good condition. 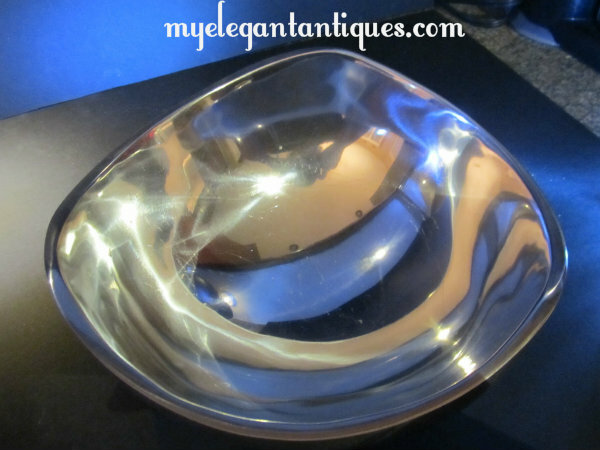 The exterior of the bowl is bright and unblemished, with no oxidation, abrasions or scratches. The interior of the bowl does show a few use marks and scratches. Please review our pictures in order to obtain an accurate description of condition. Priced to account for these minor condition issues, this Nambé bowl will be a perfect addition to your tableware, or an exceptional gift for a friend or loved one! ABOUT NAMBE': Nambé is an eight-metal alloy whose major component is aluminum. It does not contain silver, lead or pewter (a tin and lead alloy) and resists tarnishing. Nambe' was developed in 1953 by Martin Eden, a former metallurgist at the Los Alamos National Laboratory. The alloy is exclusively produced by the Nambé Mills, Inc., which was founded in 1951 near Nambé Pueblo, some 10 miles north of Santa Fe, New Mexico. The alloy has the luster of silver and the solidity of iron, and has a lower thermal conductivity than silver. 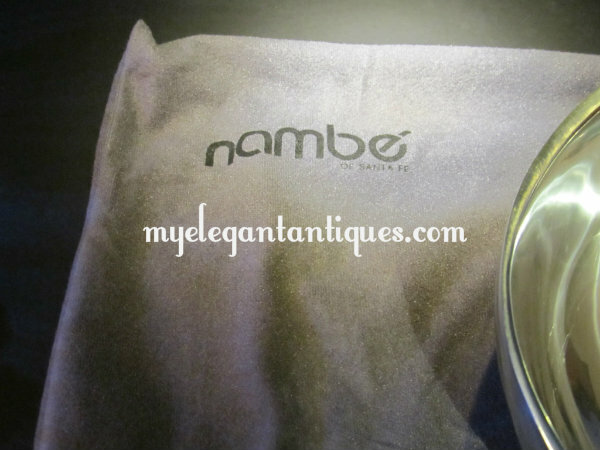 Nambé metal products are often sand cast and polished to a high luster to create aluminum alloy products such as serveware, cookware, bowls, platters, trays, dishes, plates, napkin rings, candle holders, wine bottle holders, martini shakers and coasters. 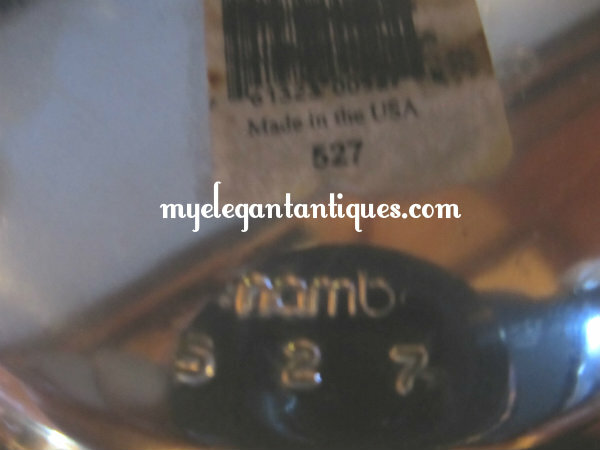 Nambe is similar to the metal alloy products of Carson's Statesmetal and Wilton Armetale. All three metal alloy products share the following characteristics: they have been declared safe by the FDA for use with food products; and all three of the products are susceptible to discoloration or pitting with acidic foods. For that same reason, food should be stored in plastic and not in Nambe metal.